Comprehensive Membrane Science and Engineering, Second Edition is an interdisciplinary and innovative reference work on membrane science and technology. 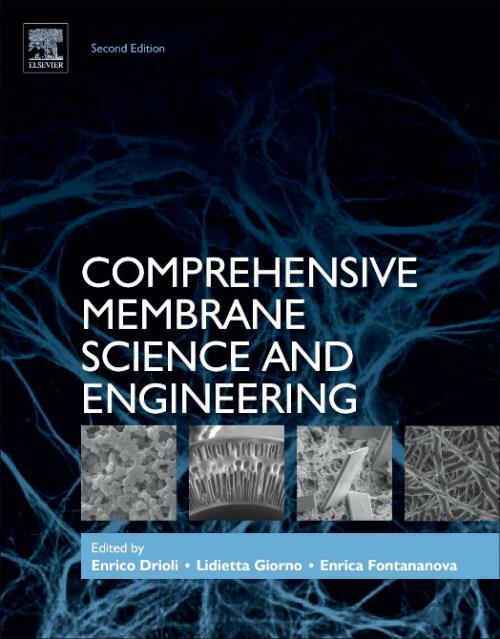 Written by leading researchers and industry professionals from a range of backgrounds, chapters elaborate on recent and future developments in the field of membrane science and explore how the field has advanced since the previous edition published in 2010. Chapters are written by academics and practitioners across a variety of fields, including chemistry, chemical engineering, material science, physics, biology and food science. Each volume covers a wide spectrum of applications and advanced technologies, such as new membrane materials (e.g. thermally rearranged polymers, polymers of intrinsic microporosity and new hydrophobic fluoropolymer) and processes (e.g. reverse electrodialysis, membrane contractors, membrane crystallization, membrane condenser, membrane dryers and membrane emulsifiers) that have only recently proved their full potential for industrial application. This work covers the latest advances in membrane science, linking fundamental research with real-life practical applications using specially selected case studies of medium and large-scale membrane operations to demonstrate successes and failures with a look to future developments in the field. Enrico Drioli is Emeritus Professor at the School of Engineering of the University of Calabria. Founding Director of the Institute on Membrane Technology, CNR,Italy. Since 2012 Distinguished Adjunct Professor, CEDT King Abdulaziz University, Jeddah Saudi Arabia; since 2010 WCU Distinguish Visiting Professor, at the Hanyang University, Seoul Korea; His research activities focus on Membrane Science and Engineering, Membranes in Artificial Organs, Integrated Membrane Processes, Membrane Preparation and Transport Phenomena in Membranes, Membrane Distillation and Membrane Contactors, and Catalytic Membrane and Catalytic Membrane Reactors. He is involved in many International Societies, Scientific Committees, Editorial Boards, and International Advisory Boards. Currently Chairman of the Section on "Membrane Engineering" of the European Federation of Chemical Engineering and coordinator of EU-EUDIME Doctorate School on Membrane Engineering. He has been coordinator of several international research projects. He is the recipient of various Awards and Honours, ex. "Richard Maling Barrer Prize of the EMS, Academician Semenov Medal of Russian Academy of Engineering Science, MIAC International Award for his contributions in the field of Membrane Science and Technologies, etc. He is author of more than 800 scientific papers, 22 patents and 24 books on Membrane Science and Technology. Lidietta Giorno is a membrane biotechnologist with a strong background in biological science, chemical technologies, and new materials. Her research experience includes membrane bioengineering, biocatalytic membrane reactors, integrated membrane systems for bioseparations and bioconversions, downstream processing based on molecular separation, membrane chirotechnology, and membrane emulsifiers. She has been involved in membrane science and engineering research and development for almost twenty years. She is Director of the Institute on Membrane Technology of the National Research Council of Italy, ITM-CNR, and is involved in research co-operations at the European and international levels. Dr. Giorno has worked abroad in the USA at Sepracor Inc., in 1992; in The Netherlands at ATO-DLO, in 1994; in France, at The University of Compiegne, in 1997 and 2000. She is Visiting Professor at Tianjin University of Science and Technology, China, since 2008. Lidietta Giorno is co-author of three books and some 70 peer-reviewed scientific papers in international journals. She is a member of the editorial boards and referee pools of scientific journals and research agencies, and she sits on the boards of several international committees and scientific societies. In addition, Dr. Giorno has served on the European Membrane Society Council for two mandates and is currently the President of the EMS Council and editor of the EMS Membrane Newsletter. Enrica Fontananova is a Researcher at the Institute on Membrane Technology of the National Research Council - ITM-CNR (since 2011) and graduated with laude in Organic Chemistry (2001), PhD in Chemical and Materials Engineering (2008). Her main research activities include: design and development of polymeric and mixed matrix membranes, nanostructured membranes, catalytic membranes and membrane reactors, membrane separation processes, membrane contactors, organic solvent nanofiltration, membrane assisted crystallization, electrochemical impedance spectroscopy for membrane and interface characterization, ion exchange membranes and electrochemical membrane processes. She is involved in various national and international research projects, also as principal investigator. Member of Editorial and Review Boards, Scientific Committees and Doctorate Boards. She is an invited speaker at numerous international conferences and recipient of several scientific awards and honours (e.g. invited keynote speaker at the conference Euromembrane 2009; 1st Prize for "New ideas for industrial applications NanoMemPro Awards 2006). She is a co-author of more than 50 peer-reviewed scientific papers in international journals, 18 contributions in books and encyclopaedias, more than 100 contributions in conference proceedings, and 2 patents.